THIS YEARS RALLY IS COMPLETELY BOOKED AND WE ARE NO LONGER ACCEPTING SIGN UPS. HOWEVER, IF YOU WOULD LIKE TO BE ADDED TO THE WAITING LIST PLEASE SEND US AN EMAIL AND WE WILL INFORM YOU IF A SPOT BECOMES AVAILABLE. THREE FUN AND ADVENTUROUS DAYS IN THE NEVADA DESERTS AND MOUNTAINS EXPLORING GHOST TOWNS WITH SEVERAL KNOWLEDGEABLE GHOST TOWN GUIDES. MAKE NEW GHOST TOWN FRIENDS AND EXPLORING PARTNERS! 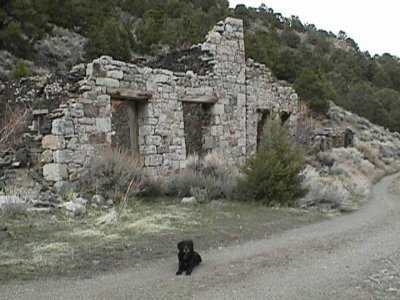 WE'LL BE VISITING: BELMONT, BARCELONA, OPHIR CANYON, PARK CANYON, JETT CANYON, JEFFERSON, AND OTHER NEARBY GHOST TOWNS. THERE IS NO CHARGE TO ATTEND THE RALLY OTHER THAN YOUR OWN EXPENSES! WE'RE HOSTING THIS RALLY FOR FUN, NOT FOR PROFIT! WE'LL BE HOMEBASED IN TONOPAH, NEVADA WHERE BOTH GAS AND GROCERIES ARE AVAILABLE, AS WELL AS LODGING AND PRIMITIVE CAMPING. FOR LODGING WE SUGGEST THE CLOWN MOTEL (775) 482-5920. MENTION THAT YOU'RE COMING FOR THE GHOST TOWN RALLY AND GET THE ROOM FOR $30 (FOR A SINGLE) NORMALLY $37. THE CLOWN MOTEL ALSO ACCEPTS PETS! 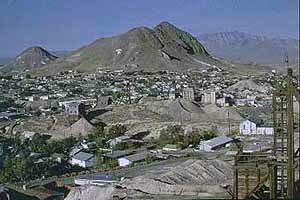 PRIMITIVE CAMPING WILL BE AVAILABLE IN TONOPAH AT THE TONOPAH HISTORIC MINING PARK. A BATHROOM WILL BE MADE AVAILABLE BUT THERE ARE NO SHOWERS AND NO POWER TO THE SITES. CAMPING IS ALSO AVAILABLE AT NEARBY CAMPGROUNDS (10-12 MILES AWAY) OR WHEREVER YOU PREFER OUTSIDE THE TOWN LIMITS. 4X4 VEHICLES ARE NOT MANDATORY BUT ARE HIGHLY RECOMMEDED. IF YOU DO NOT HAVE A 4X4 VEHICLE THERE MIGHT BE ROOM IN OTHER VEHICLES FOR YOU TO RIDE IN BUT THERE IS NO GUARANTEE. MOTORCYCLES AND QUADS ARE ALSO WELCOME. EVERYONE IS WELCOME TO COME, ADULTS, KIDS AND DOGS ALIKE. HOWEVER AGGRESIVE DOGS ARE PROHIBITED! IF YOUR DOG IS AT ALL LIKELY TO FIGHT OR ATTACK PLEASE DO NOT BRING HIM/HER ALONG. THERE WILL BE LOTS OF OTHER DOGS AND SMALL CHILDREN, WE'D LIKE TO AVOID ANY PROBLEMS IF AT ALL POSSIBLE. THANK YOU FOR YOUR COOPERATION. MEET 7PM AT THE TONOPAH CONVENTION CENTER FOR A GHOST TOWN SLIDE SHOW AND TO MEET ALL THE OTHER GHOST TOWNERS THAT WILL BE WITH US FOR THE RALLY! A SPECIAL RAFFEL WILL BE HELD ON SATURDAY NIGHT AT THE BBQ. PRIZES WILL INCLUDE GHOST TOWN BOOKS, MAPS, RALLY TSHIRTS, ECT. RAFFLE TICKETS GO ON SALE FOR $1 A TICKET. MEET 9AM AT THE TONOPAH HISTORIC MINING PARK. GROUP WILL HEAD OUT FOR GHOST TOWNS FROM THERE (SITES TO BE ANNOUNCED). BYOL (bring your own lunch), LOTS OF WATER, YOUR CAMERA AND LOTS OF FILM! THERE WILL BE SOME WALKING AND LIGHT HIKING, MAKE SURE TO WEAR STURDY SHOES AS WELL AS OTHER GEAR FOR HOT & SUNNY WEATHER. MEET 7PM AT THE MINING PARK FOR OLD WEST BBQ! COST IS $15 FOR STEAK OR CHICKEN, SALAD, BEANS, CORN AND BEVERAGE. CHILDREN'S DINNER (10 YEARS AND YOUNGER) IS $10. SWAP STORIES AND SHARE YOUR ADVENTURES WITH THE OTHER RALLY GOERS WHILE YOU WOOF DOWN SOME FANTASTIC FOOD! RAFFLE WINNERS TO BE ANNOUNCED AT THE BBQ! YOU MUST BE PRESENT TO WIN! MEET 9AM AT THE MINING PARK. GROUP WILL HEAD OUT FOR GHOST TOWNS FROM THERE (SITES TO BE ANNOUNCED). BYOL, LOTS OF WATER, YOUR CAMERA AND LOTS OF FILM! MEET 7PM AT LOCAL TONOPAH RESTAURANT (SITE TO BE ANNOUNCED). THIS DINNER IS OPTIONAL. ANOTHER NIGHT OF SHARING ADVENTURE STORIES AND GETTING TO KNOW OTHER RALLY GOERS. FOR THOSE OF YOU THAT CAN STAY MONDAY MEET 9AM AT THE MINING PARK. GROUP WILL HEAD OUT TO GHOST TOWNS (SITES TO BE ANNOUNCED). BYOL, LOTS OF WATER, YOUR CAMERA AND LOTS OF FILM! THE GUIDES NEED TO BE BACK TO WORK ON TUESDAY MORNING AND SO WILL BE HEADING HOME BY 4PM. We still dont have a firm price on the shirts, but we're guessing they will run anywhere from $12-$15 for Small-Xlarge and a few dollars more for larger sizes. Sorry, adult sizes only.